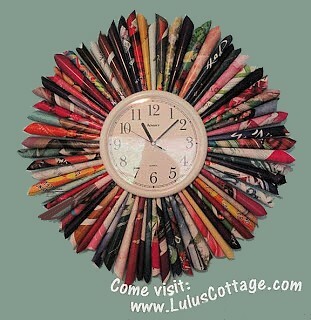 Reuse old magazine pages to make a colorful, eye-catching clock for your home. Make a colorful and fun arts and crafts clock with recycled magazine pages. This project is very easy to do in one to two hours, for ages from 10+. 1. Tear out colorful pages from magazines. 3. Tape the rolled up page to hold. 4. Repeat, making as many rolled up pages as you need to fan out around your clock. 5. Turn your clock upside down, and on the back place double sided tape all around the outside edge. 6. Place your rolled up magazine pages all around the clock, mixing the colors as you go. You may want to trim your rolled up pages so that they are uniform. Just cut the small end to the desired length. Press the rolled pages down firmly to make sure they are all secure. 7. Place tape on top of the pages to anchor. 8. Turn your clock over, hang on the wall and enjoy! About the Author: Stephanie Farrell is a mom, grandma, crafter, rock ‘n’ roll singer and the talented creative force behind LulusCottage.